Patrick Kane and Jonathan Toews came up big for the Chicago Blackhawks when it counted the most. Kane scored with 16.1 seconds remaining on an odd-man rush and Toews assisted on both third-period goals as the Blackhawks rallied for a 4-3 victory over the Anaheim Ducks on Wednesday night. "That's what they bring. They get one chance and it is in the back of the net," Chicago coach Jeremy Colliton said. "It was a big game. I didn't think we were very good, but we found a way to make some plays." Alex DeBrincat scored two goals, Artem Anisimov had a short-handed goal and Corey Crawford made 29 saves as the Blackhawks snapped a two-game losing streak. Kane got his seventh game-winning goal of the season and 60th of his career when he fired a wrist shot past Ryan Miller. Toews was able to get the puck out of the Chicago zone with a pass near center ice to Brandon Saad, who was able to skate past two Anaheim defenders before he found Kane. The goal was Kane's 40th of the season and just the second time in his career he has reached that mark. He had 46 in 2015-16. 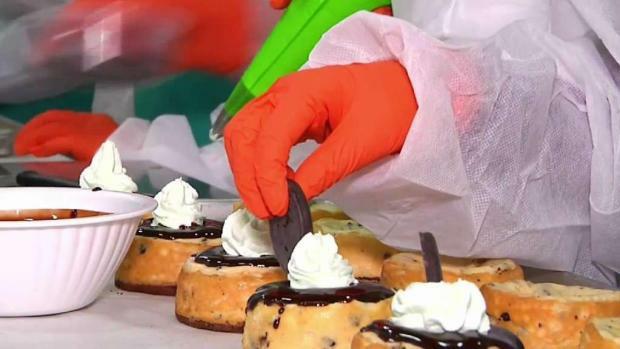 Girl Scouts teamed up with workers at Eli's Cheescake to create some delicious treats and learn important lessons about business. NBC 5's Sabrina Santucci reports. Toews also assisted on Chicago's tying goal at 15:06 of the third when he around the net made a cross-crease pass to Alex DeBrincat, who beat Miller on his stick side for his second goal of the game. The win is Chicago's ninth in the 13 games it has played since the All-Star break. They remain five points behind Colorado for the final wild-card spot in the Western Conference but their 18 points since the break are the second-most in the conference. "It's huge," Kane said. "It keeps us in the race and gives us a little confidence when I know we think we can play better, too." Meanwhile, Anaheim is going in a different direction. The Ducks have dropped their last four and are 3-10 since the break. After Chicago's mayoral field thinned from 14 candidates to two, both Lori Lightfoot and Toni Preckwinkle are trying to pivot their campaigns, and change their messages up before April. NBC 5's Mary Ann Ahern has the latest. Devin Shore, Carter Rowney and Troy Terry scored for Anaheim, which has dropped its last four. Miller stopped 31 shots. "The main them is we're struggling to score goals. We're playing good hockey, but just not getting the results," Terry said. With the two goals, DeBrincat has 36 on the season and became the fourth player in Blackhawks history to score 35 or more goals in a season at age 21 or younger. He joined Bobby Hull, Steve Larmer and Jeremy Roenick, who did it two straight seasons. DeBrincat gave the Blackhawks an early lead 49 seconds into the second period on the power play when his shot from the left faceoff circle went off the post and past Miller. The goal came 13 seconds after Anaheim's Rickard Rakell was ejected and given a five-minute major for hitting Drake Caggiula from behind and into the boards behind the Chicago net. Caggiula suffered a concussion and did not return. The Ducks evened it at 1 at 4:22 when Shore scored a short-handed goal on a 2-on-1 rush. It was the forward's seventh of the season and just the third short-handed goal by Anaheim. Both teams then traded goals less than two minutes apart late in the second. Anisimov put Chicago ahead at 16:42 on a short-handed rush up ice when he snapped one past Miller's blocker for his 11th of the year. Rowney tied it at 18:37 with his fifth in 44 games when he redirected Ryan Kessler's pass in front of the goal. 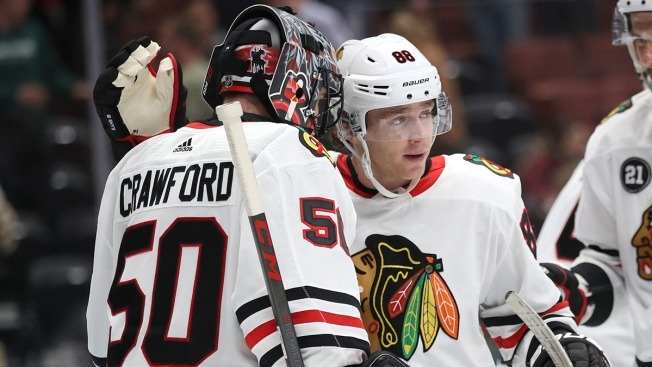 Terry scored his second goal of the season at 5:35 of the third when he took a pass from Derek Grant and put it past Chicago's Corey Crawford, who was unable to clear the puck out of his zone. Crawford struggled to play the puck behind the net, which allowed Grant to skate in, grab possession and make a between his legs pass to Terry.